to grow a great Christmas tree. SOMERVILLE NURSERIES WAS FOUNDED BY JOHN SOMERVILLE IN 1950. John was a recent forestry graduate from University of Toronto. He first planted Scotch pine on vacant land owned by the lumber company his grandfather started in 1900. 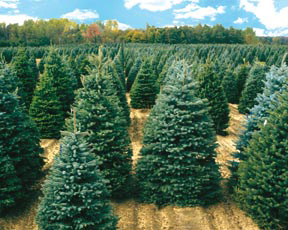 Over 60 years later the company has emerged as one of the largest growers of Christmas trees in North America with over 2000 acres in production in the Alliston area. Our focus now is on growing Balsam and Fraser fir, as well as Spruce and Pines. In our 50th year John Somerville remarked that “looking back on 50 years spent growing evergreen trees and harvesting hardwood woodlots it is hard to imagine any other profession providing as much satisfaction.” John’s advice to us was to “grow the very best quality tree and listen to your customers”. WE THANK YOU VERY MUCH FOR SHOPPING KRISS KRINGLE. YOUR SUCCESS IS OUR SUCCESS.